They said it was 100 miles…they were wrong! Today must rank as one of my BEST days on a bike. 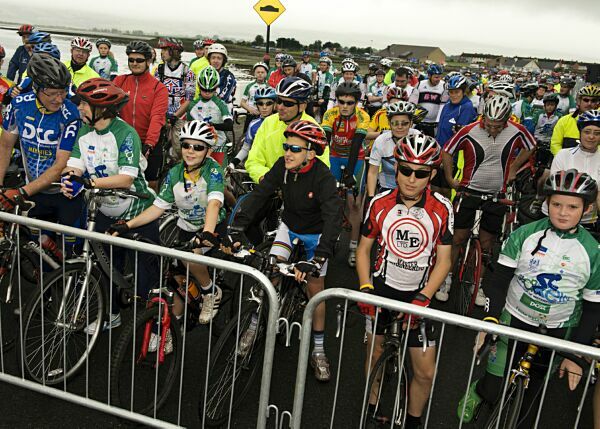 The Sean Kelly Tour of Waterford attracted a massive 3670 entrants, and everything about it lived up to the billing! After a slight hiccup because I couldn’t find the pins for my jersey number, the problem was solved as Kieran stapled it on (carefully) We set off at 7.30am in cool conditions, and met up with the Kilmac Dogs and others after just 5 miles. Thereafter we enjoyed a lovely flat spin to Carrick and on to Clonmel. Coffee & sandwiches were enjoyed at Kilmanahan just before the serious mountain sections ahead. Power’s the Pot was hard but manageable, with a cool westerly tailwind assisting us. By now our group of 8 really helped each other along, and we reached the official food stop at Rathgormack in good condition. A quick coffee and some food here, and off we set again for Mahon Bridge and the ball-breaker to Mahon Falls. This was TOUGH TOUGH TOUGH. 25 minutes of 100% effort, before the wonderful descent to Kilrossanty where bananas awaited us. Certainly at this point the legs were crying out for rest, but none was coming just yet. After a hard drag to the bottom of the final climb, we settled in to more hard work, and all the chatting stopped. I realised half-way up the four mile climb that my sugar levels were dangerously low and I needed to back off from the group along with many others. A gel sachet and two bananas took about 10 minutes to kick in, at which point I had crested the top and worked hard on the downhill the catch the lads again. Finally, as we turned for home at Beary’s Cross with 10 miles to go, the wind was behind us and we ROARED home. Our very strong pace brought many more into our group and we finished with about 15 in all. Great day, great weather, great food, great everything!